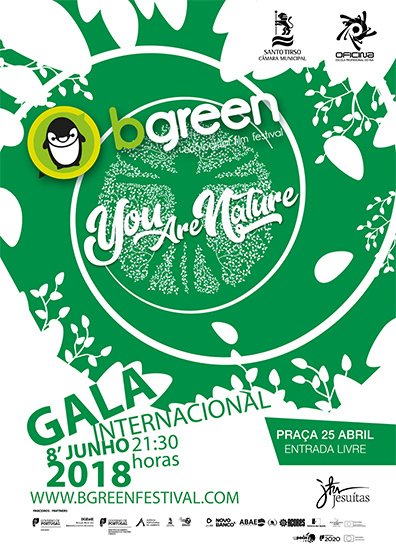 Bgreen // ecological film festival’s grand gala makes its way to the city of Santo tirso for its 8th edition. On June 8th, at around 9h30 p.m. at Fábrica de Santo Thyrso we will unveil the winners of this year’s edition. Countries such as Albania, Brazil, Argentina, France, Italy, Spain, Germany and Norway will be present at this year’s Award Ceremony. The finalists will not only be able to participate in a cultural program filled with visits to several points of interest in the Northern region of Portugal but also take part in various workshops related to the areas of sustainable development, global citizenship, communication and audiovisuals. Since the first edition of the festival in 2011 that the number of participants has been increasing dramatically. This year, Bgreen continues to consolidate its proposal regarding the level of national and international participation with the increase in the amount of countries and video spots in the competition.Under the motto You are nature, this year’s edition saw the participation of 450 spots from 16 different countries in the Bgreen Grand Prize category, thus raising to 21 the total number of countries that have been a part of this initiative. On June 8th, we will unveil the grand winners in the various categories, namely: Bgreen grand Prize, Bgreen Junior, Honorable Mention, Best Making of, People’s Choice and Alphonse Luisier Awards. The Ceremony will be broadcast live on the festival’s official website. Bgreen’s International Gala represents the outcome of a year in which environmental issues were a mobilizing agent for thousands of youngsters all around the globe. With free entrance, this great ceremony will have the collaboration of ARTAVE – Escola Profissional Artística do Vale do Ave (ARTAVE – Vale do Ave’s Professional Artistic School), Backstage – escola de dança e artes performativas (BACKSTAGE – Dance and Performative Arts School) and also INAC – Instituto Nacional de Artes do Circo (INAC – Circus School).